Located within shouting distance of Pennsylvania Dutch country, the Delaware Valley is none too far from the home of many snack-food companies. Following the lead of Snyder's of Hanover, regional purveyor Bachman has intro'd a gluten-free pretzel, the proceeds for which will support autism research. As I wrote this week, the company's gluten-free Puzzle Pretzels are made in a dedicated gluten-free facility. Congratulations to reader Martha L., the winner of the last week's Live Gluten Freely giveaway. Readers suggested a bunch of different restaurants as their favorites - check out the comments to see if yours made it. In restaurant news, The Capital Grille in King of Prussia (236 Mall Boulevard, 610-265-1415) will open for business on Monday, November 8. The steakhouse has other area locations in Center City and Cherry Hill. The Bottle Shop, a new craft beer store in South Philadelphia (1837 East Passyunk Avenue, 215-551-5551) has Woodchuck cider and beers such as Estrella Damm Daura and New Grist. The new Philadelphia Gluten Free Ravioli Pasta Company has begun taking orders on its website. The company's gnocchi and cheese, spinach, mini and rice-breaded raviolis will also be available soon at their storefront in Media. The pasta is certified gluten free by the Celiac Sprue Association. Jason's Deli in Willow Grove, which offered Udi's gluten-free bread for sandwiches, has closed. Sports fans interested in catching a Nets or Devils game up the road at the Prudential Center in Newark, New Jersey can now eat gluten free there. The concessionaire, Centerplate, now offers gluten-free sausages and hot dogs served on The Grainless Baker's buns, garden and Caesar salads, packaged gluten-free snacks, and Redbridge beer. The gluten-free location is situated on the main concourse between Sections 5 and 6. The research-and-development team at Ian's Natural Foods apparently has been working overtime. 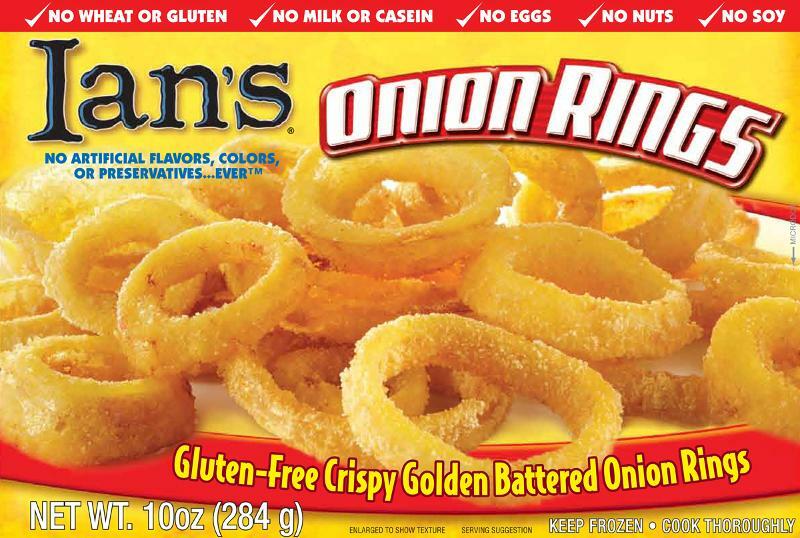 The company will be launching onion rings that are free of gluten, dairy, eggs, soy and nuts. They will be available in January 2011, and have already been picked up nationally by Whole Foods. 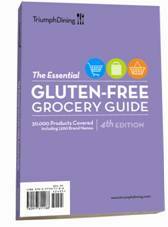 The new (4th) edition of Triumph Dining's Gluten-Free Grocery Guide ($21.95) has been released, listing over 30,000 brand-name and store-brand gluten-free products at grocery stores across the United States. Through December 7, Triumph is offering free standard shipping on all of its products, which include the Grocery Guide, Restaurant Guide and Dining Cards. Use code SB868N at checkout. Thanks to those readers who have supported Gluten Free Philly through Amazon.com purchases that originate from my blog. CORRECTED: The original version of this post incorrectly noted that The Capital Grille won the "People's Choice" award at the recent Appetite for Awareness event. It was The Palm for its gluten-free crab cakes. Sonata is one of my favorite spots in town, but I must give exceptional mention for my most recent experience. I am a nursing mother with a baby that's allergic to gluten, dairy, soy, and tree nuts; therefore, I cannot eat those foods either. I feel like such a high maintenance jerk ordering food and asking the server questions about what they cook with and so on. So I contacted Sonata via their website/email asking if they cooked with butter and what on their menu would work for me. My email was responded to the next morning and followed up with a phone call from the chef/owner. He said he could easily accommodate my food issues. That evening I was handed a printed menu just for me with several choices of appetizers and entrees that contained no gluten, dairy or soy!! Also, he printed another menu for my husband (who is gluten intolerant) that was all gluten-free choices including the infamous Lobster "Mac & Cheese" with gluten-free pasta! I have never felt so at ease ordering! Chef Mark came out to greet us as he usually does...I couldn't thank him enough for his generous accommodations! Oh, and because they make all deserts in house, the trio of sorbets was amazing, enjoyed by myself and my baby! !